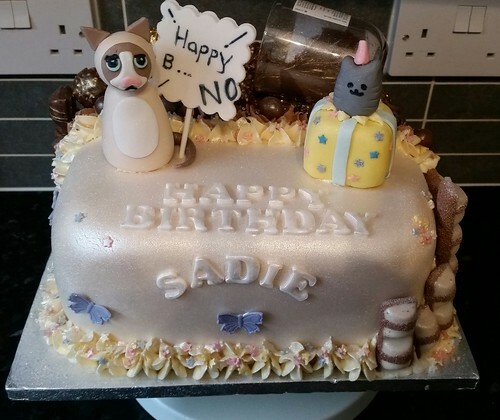 Last year they had a Rugby Player Cake and a Three Tier Unicorn Cake. This year, they opted for a joint cake. 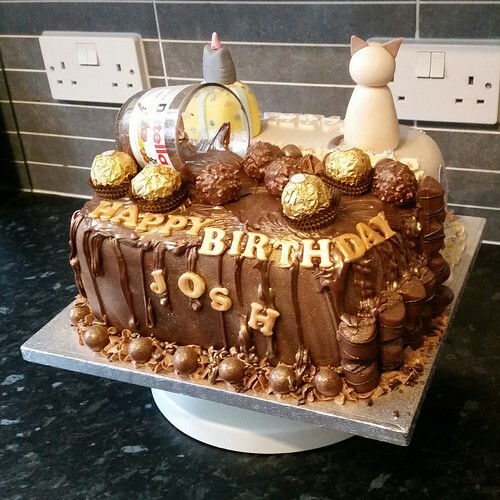 My nephew asked for his "half" to be much the same as the Nutella Cake his cousin received last month - with chocolate sponge, ganache etc - whilst my niece wanted something a little more "simple". 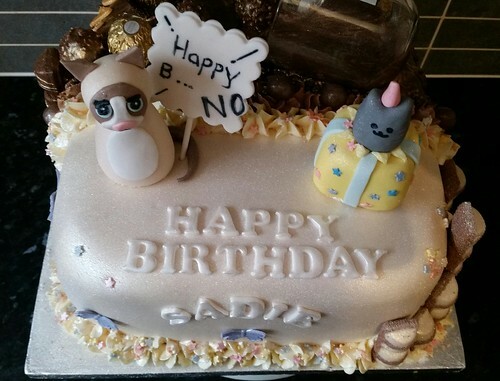 All she wanted was a gentle vanilla sponge decorated with her two favourite internet sensation cats - Grumpy Cat and Pusheen. Each "half" was completely different from the other, which reflects my niece and nephew's differences in personality. Therefore, I made two different cakes and "spliced" them together to make one! 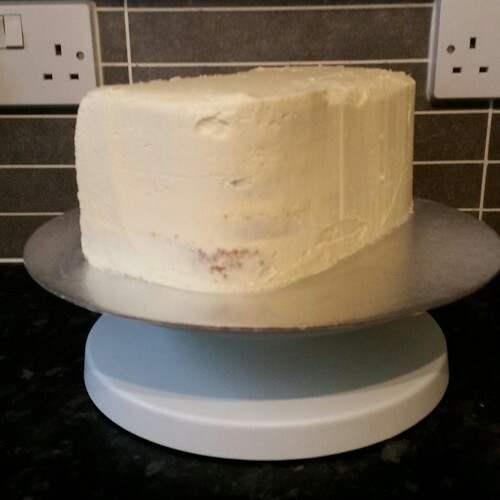 Making sure the height on both chocolate and vanilla sponges were the same, which would ultimately involve sandwiching them together with the same thickness filling, I cut the sponges in half and sandwiched them on top of the same flavour cake. 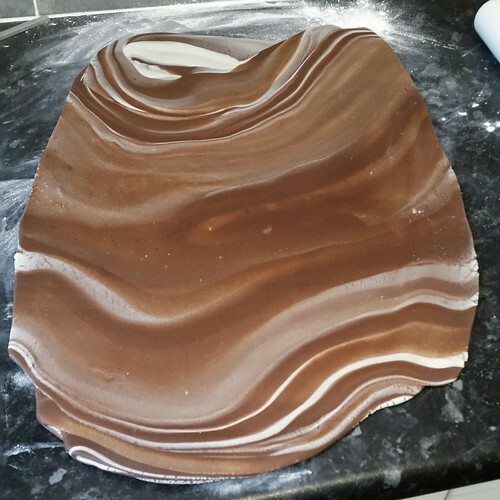 Each sponge consisted of a mix and a half of the recipe and baked in a 23.5cm square tin. As the mix was larger, I decreased the temperature down to gas #3 and baked slowly for at least an hour each. ... 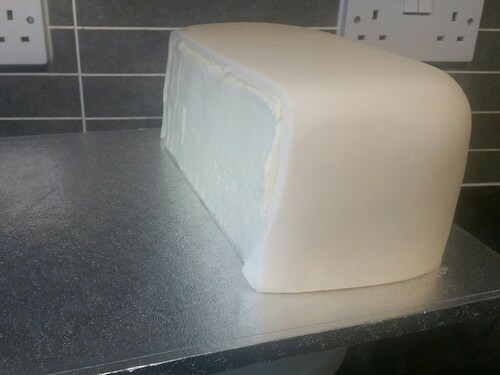 The vanilla half had a simple vanilla sponge and was sandwhiched together with basic vanilla buttercream and crumbcoated with the same. The Nutella half was covered with a marbled mix of Renshaws chocolate flavoured fondant and Renshaws white chocolate flavoured fondant. I'm not quite sure what happened with the marble effect, but it didn't turn out as awesome as I'd hoped. But it's still awesome I think. For the vanilla half, my niece wanted the Renshaws white chocolate flavoured fondant. 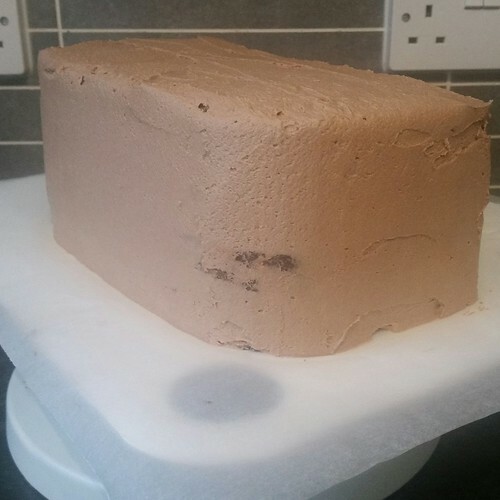 Up until now, both halves of this cake have been treated as two individual cakes, so a very sparing spray / sprinkle of simple syrup was used to join the sponges together inside and some edible glue was used along the raw edges of the fondants to encourage those to stick together. The "tricky" part here, I guess, is the fact that the niece wanted no part of her brother's decoration to accidentally find its way over "her half". With this in mind, I pipped on the joining edge with each flavoured frosting on the correct side of the cake. This was to ensure that the Nutella would not encroach onto the vanilla side! Both my niece and nephew were enlightened to the fact that the very centres would be edged in their own frostings and that these would be touching each other. I couldn't see any other way around it. With the exception of a cake card in the middle, and I didn't want to go down that route. 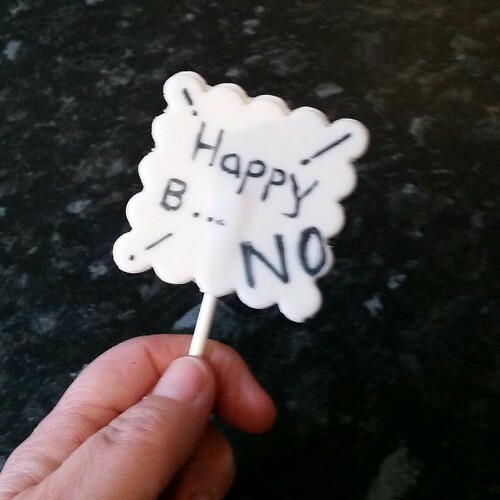 The 'Happy' on this side refused to slide down the side like the 'Birthday' and my nephew's name. But it's refusal to 'conform' has not ruined the overall effect. 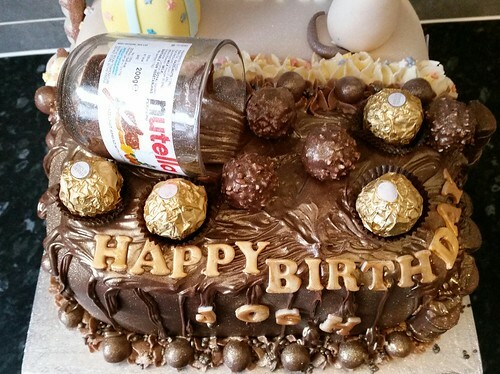 The Nutella side was generously doused with gold dust, topped with Ferrero Rocher, some open, some wrapped. 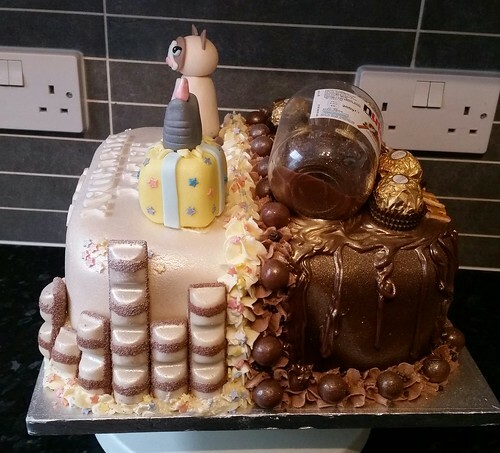 The pipping was topped, alternately, with Maltesers plus some chocolate covered popping candy then a few sticks / chunks of Kinder Bueno were added to the sides for decoration. The vanilla side was doused in silver dust with an added "something" (see below). 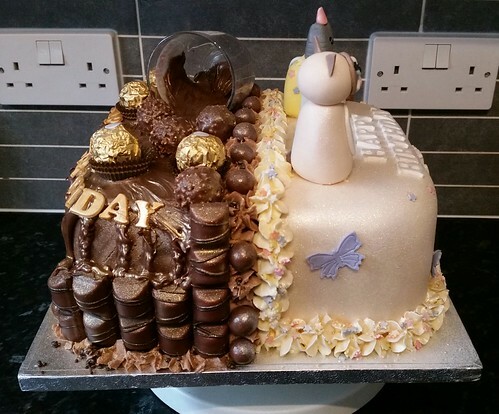 The piping on this side was sprinkled with sugar stars and some white Kinder Bueno was added to reflect her brother's half. Oh! Plus one or more purple butterflies.